Baseball insights from any web page! 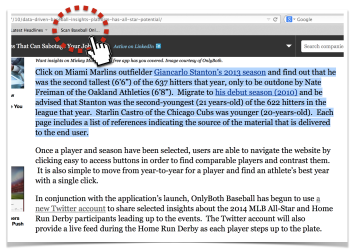 Finding interesting and timely insights about baseball players is now easier and faster than ever with Scan Baseball, the new OnlyBoth bookmarklet feature. Imagine how hard it is for baseball commentators and writers to come up with new, interesting angles when they have to cover certain games, teams, or players. And what about those baseball articles that mention several players and you can’t quite put your finger on what makes each player special or unique? If that sounds familiar, don’t worry. We just launched a new feature that lets you research baseball players from just about anywhere on the web. To install it, visit this page and drag the “Scan Baseball” button to your bookmark bar on any browser. Then, next time you browse the web and see a baseball player you want to discover something novel about, just highlight the player’s name, click the bookmarklet, and OnlyBoth will launch with insights for that player (assuming we can match the name). The OnlyBoth bookmarklet automatically selects all text on a page by default. But if you just want to research a single player, highlight the name first, and OnlyBoth will take you straight to that player’s insights page. Our easy-to-install and lightweight Scan Baseball button lets baseball researchers (i.e., media and commentators) quickly scan a web page for baseball players that OnlyBoth can provide new insights for that aren’t available elsewhere. Whether you’re researching someone who played last year, or you’re intrigued by a former or famous baseball player from the 1800s, our new feature makes it easy for you to improve your baseball knowledge like you’ve never experienced before. Onlyboth is about more than automated discovery and writing. It’s also about doing so in context, helping people just in time. Still all automated.